The series premiere for The Rookie is Tuesday, October 16, 2018 10|9c. To get you ready for this new drama, we thought it would be fun to hear what the show's creative forces and talent had to say about their brand new series. 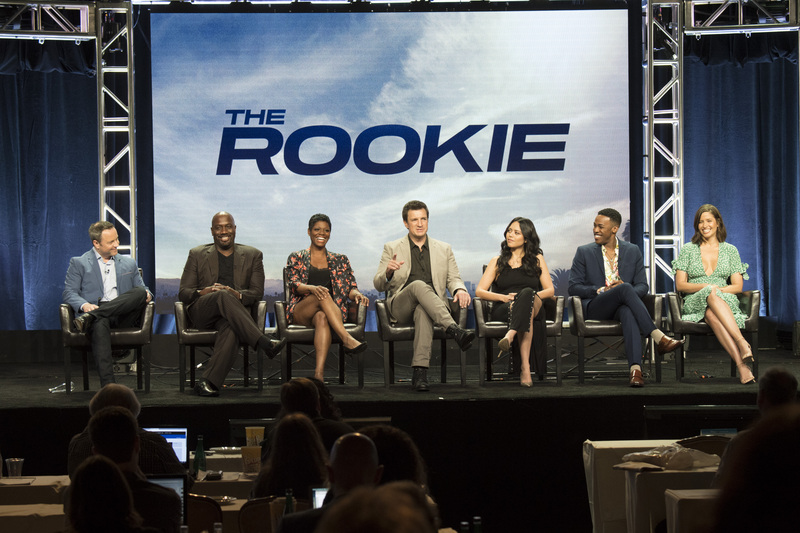 The TCA 2018 Summer Press Tour rolled into Beverly Hills to catch up with the cast and producers of ABC's new drama series The Rookie. Watch the official trailer and read about the highlights of the panel discussion below. Nathan Fillion said he's been working for ABC since about 1994. He knew he could bank on Creator/Executive Producer Alexi Hawley when he first learned about the show. He was in even before he saw a script. Mr. Hawley added that Nathan would probably say he was drawn to the humanity of his John Nolan character. Nathan joked that he likes that things are rough for John Nolan on the streets because, in real life, kneeling is a stunt for him. He feels that "the do-over" is the new norm in our society so Nolan's story is very relatable. Richard T. Jones spoke to a question about how hard his character is on rookie John Nolan. There's a fear that people get set in their ways at a certain age. That means you may not want to follow instructions. Afton Williamson said that the cast all sat in on a roll call at a real police station. She learned that it takes a certain type of person to be a training officer. It has to be something you really want to do. Afton's Talia character "really" wants to be a T.O. Nathan Fillion spoke about his rookie experience as an actor when he was on a soap opera. It was a valuable experience for him. He also talked about how hard it was to get a job after he moved to L.A. Then he scored a past ABC sitcom called Two Guys and a Girl. Mercedes Mason spoke about playing a female captain in the police force. Her research told her that there are two strikes against you when you walk into such a position in real life. Nathan's character is old for what he does and her character is young for what she does. About The Rookie: Starting over isn't easy, especially for small-town guy John Nolan who, after a life-altering incident, is pursuing his dream of being a Los Angeles police officer. As the force's oldest rookie, he's met with skepticism from some higher-ups who see him as just a walking midlife crisis. If he can't keep up with the young cops and the criminals, he'll be risking lives including his own. But if he can use his life experience, determination and sense of humor to give him an edge, he may just become a success in this new chapter of his life. The series stars Nathan Fillion as John Nolan, Alyssa Diaz as Angela Lopez, Richard T. Jones as Sergeant Wade Grey, Titus Makin as Jackson West, Mercedes Mason as Captain Zoe Andersen, Melissa O'Neil as Lucy Chen, Afton Williamson as Talia Bishop and Eric Winter as Tim Bradford. News When Is the NFL Draft 2019? Date and Schedule Announced! ABC Updates has been added to My List.